Reviews between: Any Jan. Feb. Mar. Apr. May June July Aug. Sep. Oct. Nov. Dec. Any 2007 2008 2009 2010 2011 2012 2013 2014 2015 2016 2017 2018 2019 and Any Jan. Feb. Mar. Apr. May June July Aug. Sep. Oct. Nov. Dec. Any 2007 2008 2009 2010 2011 2012 2013 2014 2015 2016 2017 2018 2019 Sort By: Review Date Desc. Review Date Asc. Most Helpful Recently Updated Current Mix Rating Desc. Rating Asc. Member Name Desc. Member Name Asc. Pros: There's nine baskets and almost nine tee markers. They keep the grass mowed. It looks like they built a new playground relatively recently that required them to move a couple of the holes. Thus, the course map on site is completely wrong and what's left feels even more crowded. There's only a handful of small trees, so they've got mandos everywhere. Yellow posts three or four feet high, and most of them are downright stupid or dangerous. Some require you to throw dangerously close to the playground. Some require you to throw towards a street. Some require you to throw towards a canal that could easily eat a disc with an errant gust, and it can definitely get windy out here. Other Thoughts: The tee markers are small concrete pads about the size of parking bumper, but set flush (or slightly below) the ground. A couple are missing, and the rest can be hard to find until you're standing on them. There's nothing standing above the ground that actually shows you where they are. I was the only person playing on a gorgeous Saturday afternoon, but a couple of people came out to use the area as a dog run while I was on the other side of the course. It's the only course for more than an hour in any direction, and I suppose it's better than nothing, but I'd really rather be playing in the desert than crammed into this little corner of a park with hazards all around. very open and good for beginners. I like the concrete tee markers but there is nothing above ground to show where the tees are so youre often searching around for the next tee. the mandos....oh dear the mandos! i get that they wanted to make it a little challenging but holy moly. Other Thoughts: this is a nice little open course...would be perfect for beginners if they would design it a little better. Nice, clean area...not the best design. Pros: The park is very well-maintained; grass cut low, and no debris or trash. Only course within 60 miles, so I was just happy to know there were baskets at where I moved to. The 3 ft.(?) yellow "mandos" spice it up a bit and act as artificial obstacles, as it lacks in natural ones. There are some younger trees that appear to be planted just a few years ago that will add a nice touch later. 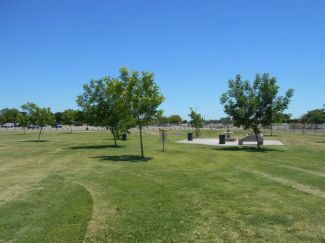 Cons: It appears the city of Yuma didn't know too much about disc golf when making this course. Hole 4 demands you throw it about 300 ft. to get to its mando where it's only about 10 ft. away from the sidewalk leaving not much margin for error, and then take a 90 degree turn to the left. Hole 6 is not far from the same as it demands you to wrap around the mando on the right side which is about 8 ft. away from the fence that separates the course and the canal. I've only been playing for over a year, but I can't imagine fresh beginners even attempting that. The "tees" are just a strip of stone in the ground marking where you throw behind. Them being in the ground makes it really hard to see. The map of the course (on the website & at hole 1) seems to be a tad off, but maybe that's just me. Other Thoughts: I applaud the City's effort in their attempt to bring exposure of the sport to this area, but maybe a slight re-configuration is needed. All in all, there are baskets in a nice well-kept area, so I can't complain that much. Pros: The course plays through a well kept area of a large multi-use park. The grass is nicely mowed and seems to have good coverage so I doubt if this course ever gets too muddy or dusty. There is some distance variety, with ace runs and some longer shots to stretch out your arm. This course is halfway between San Diego and Tucson or Phoenix, so it's well placed as a spot to stretch your legs and is the only course for a long distance in any direction so it's at least some exposure for the sport in this area. Cons: The holes are all in one small field, and it's one that's used for other sports. The park is large enough that disc golf could have been put somewhere that didn't involve throwing over picnics, soccer games and other park uses. The layout is a little odd, and crosses over itself. Many of the holes throw directly over or next to other baskets or tees, so there are some serious safety issues. The little yellow posts marking mandos don't actually make it very possible to see if they were passed on the correct side, and safety mandos in general are a terrible idea. They don't actually do anything to prevent errant shots onto other holes. There isn't any real challenge or variety here. There are no trees or obstacles, every throw is a wide open shot with nothing to make you shape any lines. The tee markers are set down into the ground so they can be difficult to find. The baskets were not in the same places as indicated on the map, so the layout was even less safe and easy to follow than the one indicated. Other Thoughts: Beginners will find the course approachable but boring, with some holes that are long enough to be frustrating for shorter throwers. More experienced players won't find anything redeeming here, with wide open shots and safety hazards. Don't bother with this one unless you just want to add to your course count. 14 of 16 people found this review helpful. Pros: The course has just been updated and completed by the Yuma Parks Department. T-Boxes are clearly marked with hole number and distance. New trees, a bike path with lights, and mandos add difficulty to the open air course. Cons: It is flat out hot in Yuma from June to Sept. We still play it but bring water and then head to the river when your done. The layout is quite easy after you play it once or twice, look on the Parks Department Website and download a course map. Hole 4 is a 90 degree dogleg left with a mando. You have to backtrack about 150' after hole 4 for the hole 5 T-Box, which is the longest shot on the course. Other Thoughts: Wetlands Park is the gem of the Yuma parks. Bring your family! There is a massive and very cool playground, a fishing pond, hummingbird and burrowing owl habitat, and several covered picnic areas. Pros: The only course within 2 to 3 hours of Yuma. Cons: Very hot in summer, no shade. Open design with no real obstacles other than the mandos. No signs other than the concrete Ts. Hole 4 is nearly impossible to stay in bounds going around the mando. Makes a 90 degree turn 10 feet or so from the road. Other Thoughts: The course seems to have changed since it's original build. The map and score card don't represent what is now there. Some holes have been lengthened, to make a few par 4s and maybe par 5 on the 4th hole. Please play it and help it grow. Pros: The only 9 baskets within a 100 mile radius. The course is 100% grass covered. Cons: It's absolutely flat. You will not find more shade than that of the mando poles, the baskets and your own. There are some newly planted trees, but for now they are just twigs at the southern end near the fence near hole 8. The narrow fairway is tough at 6 and 8 on the OB side. I went OB on 6, luckily there was a hole cut in the fence to retrieve a disc that missed the drink. The canal is some place you may NOT go in to get your plastic back. Also, keep it near the basket at 2, in order to avoid the playground and away from the picnic table near basket 8. This place is used heavily by non players after noon on Sundays, so get there early. Other Thoughts: This course is new and a parks person observed our use from a distance. I hope they got a good impression since I only had a cobra and an ultimate disc with me. Drove 55 miles to play there, but for some reason, I wasn't disappointed. There's lots of room for improvement and I think it will get there eventually. WARNING: This place is extremely hot from middle of May through Mid October. Bring water. It's turning out to be a great park. I look forward to practicing here in the future and eventually play a full round. Pros: Baskets- New DISCatcher baskets in great shape. Terrain- Well-maintained, all-grass course. Perfect for rollers, challenging to control skips. Cons: Tees- Grass tees with a concrete bumper at the head of each. Okay. Terrain- With the exception of a few holes at the east end, this is mostly all wide open terrain. Playing the mandos keeps it interesting. Other Thoughts: I played this course in October of 2009, about a month after the city completed installation--way to go Yuma! This is a fun place to go out and toss a few but the wide open terrain and very few trees really limit its challenge and interest. To spice things up, there's a unique use of mandos in the course design. There are permanent yellow posts in the ground that must be played as mandatories (1, 2, and 9 go left of post, 4, 6, and 8 go right). In addition, there are some tricky and tight OB shots where and errant throw means you're over a fence and your disc floats away down the canal or skips out in the road (450' #5, for example). All in all, while this is not a tourney course, it's a great start for Yuma and a fun little place to fling a few. Join Disc Golf Course Review for free to add your review. Have an account already? Sign In to add a review.